Listeners to Symposium’s collection may not find that Rosé’s playing retained its coldness throughout his life. He played the Sarasate Spanish Dances with solid technical command, but created a great deal of excitement in addition, with well-controlled and pure double-stops. In slow numbers like Bach’s Aria (‘Air on the G String’) from 1928, he employs portamentos (here and in Simonetti’s’ Madrigale ‘, up and right back down - or the opposite) that would make modern violinists wince, but he achieves a sort of expressivity that’s perfectly consistent with the means by which he achieved it. He didn’t hesitate to play arrangements like Wilhelmj’s of the Romance from Chopin’s First Piano Concerto, or to take liberties in performing them - or, finally, to exercise restraint in their virtuoso flourishes. His sparing use of vibrato gave his tone a bell-like clarity. But the transmission of his sound leaves a great deal to the reconstructive imagination: most of these recordings came from 1909 and 1910 (the first of the Spanish Dances came even earlier, in 1902), so the recorded sound on an immaculate surface would be compromised at best. I suspect…that had these pieces been recorded digitally, we’d find it rather easy to adjust to his manner of tone production and to enter his world. 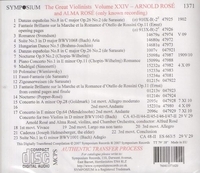 Rosé gives dashing accounts of Wieniawski’s Polonaise in D Major and Sarasate’s FAUST Fantasy and Zigeunerweisen. He could spit out staccato double-stops with crisp cleanliness, as he did in the closing pages of Ernst’s OTELLO Fantasy. Occasionally, as in the Chopin Concerto arrangement and Popper’s Nocturne, his slower passages in double-stops sound labored, but his passagework is generally light and fleet of foot. In the abridged version of the first movement of Goldmark’s Violin Concerto, a piece of which he gave the Viennese premiere in 1881, he has to rely on such swift passagework - as well as on glowing sound.… it sounds as though he had the requisite qualities (in our time, Milstein has brought similar personal strengths to the work and virtually made it his own). Bach’s Double Concerto has received many legendary performances, such as those by Kreisler and Zimbalist, Menuhin and Enescu, and, perhaps on a somewhat less sublime level, Heifetz and Friedman. The Rosés’ belongs near the top of these, with moving control of dynamics and pointed rhythmic verve (if the notes correctly identify Arnold as the first violinist, his superiority in control and force of personality over his daughter makes itself unmistakably clear). The performance includes a double cadenza by Hellmesberger, separately tracked so that listeners can skip it, but it’s so fascinating in its own right that those same listeners should return to it later. A rather headlong reading of the Adagio from Bach’s Solo Violin Sonata #1, played in 1929, once again with rhythmic acuity and a tone by turns commandingly rich and crystal-clear, brings the program to an end.…seeming a bit labored, though the tonal splendor still falls from castle walls.